Peanut butter drizzle: melt 1tbsp peanut butter with 1 tbsp butter, 2 drops of vanilla, melt in microwave. Drizzle. 1) In a pan, melt the butter and sugar substitutes until fully dissolved. I found it best to let the butter completely melt, then add the sugars, then stir occasionally for about 5 minutes. 2) Once dissolved, pour the butter/sugar into a mixing bowl and add your cocoa powder, salt, coconut oil, and vanilla. Mix until well combined. I used a whisk at first but I found that I got better results with an electric mixer. I bought this one on Amazon and it gets the job done well. 3) Once thoroughly mixed, add 3 ROOM TEMPERATURE eggs. If you just pulled them out of the fridge that’s okay, put them in hot water for about 2 minutes to bring them to room temp. Add the eggs and mix until also thoroughly blended. 4) Make sure your almond flour is sifted. It’s okay if it isn’t, but I found that my brownies were fluffiest when I sifted the small almond pieces out of my flour. You can also use coconut flour but I haven’t tried again with that and I’m giving you the recipe that gave me these amazing results. 5) Once sifted, add your almond flour and baking powder. Blend well. You should notice that your batter is rather fluffy. Great! 7) Pour your batter into the skillet. I hope you remembered to take the sticker off of the skillet first. Bake in the oven at 350° for 17-20 minutes. It should be firm but a little jiggly. Let it cool for a bit. Since you’re new to cast iron skillets I should warn you that they retain heat very well and will remain hot for a very long time. No touchy. 8) OPTIONAL: Melt 1 tbsp peanut butter and 1tbsp butter in microwave. Add 2-3 drops of vanilla. 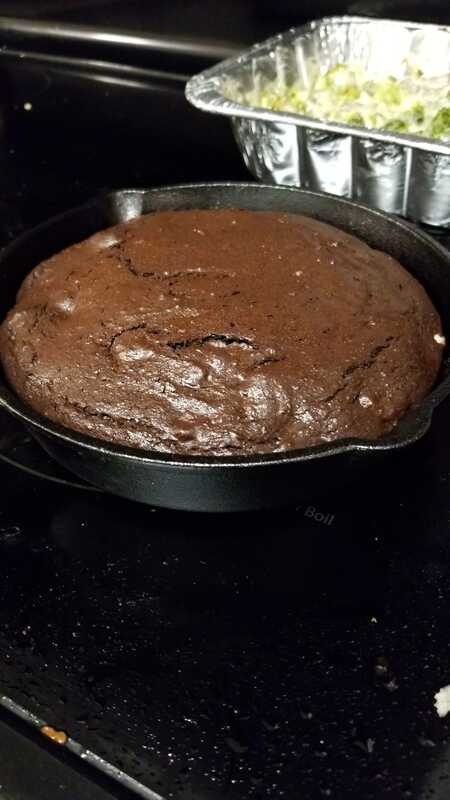 Pour over brownie. Sprinkle more crushed walnuts, drizzle some orphan tears, and enjoy! 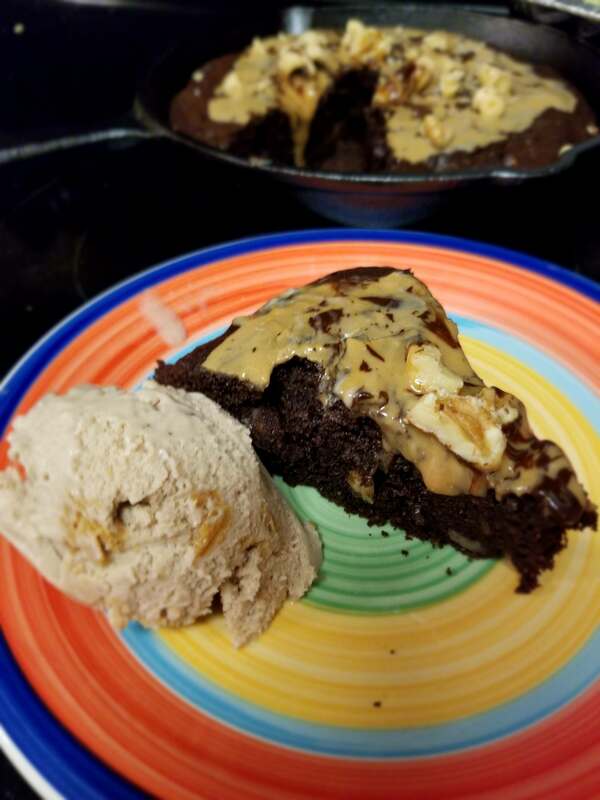 9) Pro tip: I like to indulge and enjoy my brownie with a single serving (one scoop) of Halo Top Peanut Butter Cup ice cream. You’d think I’m a big fan of peanut butter but honestly I never have been. Theres about 6 decent slices in one skillet. Do you have to use an iron skillet? I don’t own one and with my arthritis would have trouble picking one up. can i use only stevia? Yes, please, why the cast iron skillet? And what size are you talking about?